I received a tip that NET10 and Straight Talk are now allowing users to activate clean ESN Sprint phones at net10byop.com and straighttalkbyop.com . My tipster says LTE phones can be activated but isn't sure it LTE will work. 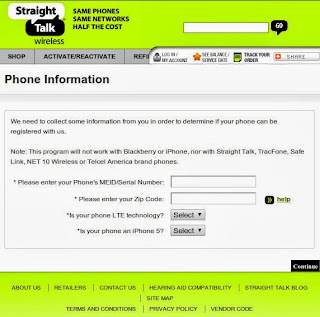 "This program is not compatible with CDMA carriers Sprint or Metro PCS, 4G LTE devices, iPhones, BlackBerry, data only devices, lost or stolen devices, branded TracFone, SafeLink, NET10, Straight Talk or Telcel America handsets"
"This program will not work with Blackberry or iPhone, nor with Straight Talk, TracFone, Safe Link, NET 10 Wireless or Telcel America brand phones." I tried it myself with the ESN of a broken Sprint HTC EVO and got as far as the site asking for my credit card. I didn't go any further because I don't have a working Sprint phone to try. If you try activating a Sprint phone on NET10 or Straight Talk let us know in a comment if it works or not. I am with you Casey. America Movil and their subsidiaries are so dishonest and provide such terrible service I would not use them if they were free. Dennis I never cease to be amazed at how well you have your finger on the pulse of the wireless industry. That change in wording would seem to leave the door open for BYOD Verizon. Any word on BYOD for the big V? NET10 and Straight Talk have had Verizon BYOD for several months. I have used Straight Talk for 14 months now with no problems. I have the Proclaim and use refill cards. My only complaint is Straight Talk needs better Verizon android phones. I will never buy a phone made by ZTE or Huawei. No thank you, I would never give my business to these thieves. I tried both and every month had my internet cut off. Every time I called I was on the phone for about 2:00 hrs with customer service. Now I have Boost Mobile and no problem at all. I have activated several Verizon Droid X2's and a Droid Incredible on their BYOP program. This is using Verizon towers, dialing *228 and option 1 to activate. Works every time. If you port in from Verizon it takes about an hour and you are up and running. Everything works, calls, text, mms, and 3G. Internet is typical Verizon 3G speed which is slow but it does work. This is an interesting change please post up if you can activate LTE capable phones, the lack of 4G doesn't bother me (I highly doubt LTE will work) but the newest 3G only phone was the Droid X2/Droid 3 and they are fairly out of date. Did you have to buy an activation kit? Why don't they specifically say anything about US Cellular in the CDMA Byop? You can't activate a US Cellular phone. How would an existing customer try this, when logging into my account . Go to straighttalkbyop,com After you enter the phone's ESN I believe there's an option to activate it on an existing account. Is this what the cdma activation kit is? This is online. You pay with the $14.99 activation fee with a credit or debit card. I don't know if the activation kits that Walmart sells will work with Sprint phones or only Verizon ones. So anybody tried it yet? Anybody tried a Verizon LTE phone either? I sent an email to Straight Talk and they responded that the Verizon service is still not compatible with 4G LTE phones but and I quote "Furthermore, 4G LTE phones on the other service provider you mentioned (Sprint) are compatible with our BYOP program." The main problems with ST/NET10. 1. Bad CS when something does go wrong (not everyone has problems but if you do its near impossible to get it fixed). 2. They don't let you bring a sprint device and let you flash it over to say verizon side of thigns which some people like about other MVNO's. 3. They have unlimited with a * which means you get what you get until they shut you off or slow you down. If you don't care about any of those go for it but they could always pull what they did with AT&T BYOD SIMS on NEt10 with limiting data on you and if you decide to take your CDMA device with you how is that going to be? I've been on Straight Talk for a year and never had a single issue.. Same here. Never had a single issue. I WANTED to have an issue, so I could see what all of the fuss was about on the internet...but it hasn't happened. Some people never have issues and that's with any service. But if you do then getting help from their "CS" is not very good. ST and Net10 offer the best priced deals around. That's consistently their strength. If you want better cs there are a huge number of other choices which may cost more dollar wise but can save you a lot of time and stress for a little bit more . Air Voice, Ptel, Att Gophone, Aio, Verizon prepaid and Gosmart are all reported to have fair to good cs. To me, cs is very important. ST and N10's price's aren't enough of a draw for me to try their rather random policies on how they treat customers. I'd rather spend a little money and save a lot of time and stress then save a little money and pay for it with hour long wait times and bad cs. As for LTE devices, Sprint ones will probably work with full data in Sprint LTE coverage areas. Idk if Tracfone/ST/N10 Sprint has roaming or not . As for Sprint byod on Tracfone's networks, it'll be any clean esn postpaid Sprint Android, Windows, and feature phone that's 3g/wimax or LTE. Nothing else. As for Verizon LTE byod. NO WAY. Not at this time. You can only put clean esn 3G/cdma/evdo Verizon postpaid devices on their Byop/ Verizon cdma program. When you get down to it, Verizon mvnos Next G, Selectel and Page Plus (even though it's now owned by the mighty Tracfone Empire too) all have better byod then ST/Net10 Verizon. As of today, Monday, October 14, 2013, Start Wireless and it's dba, Page Plus Cellular continues as an independent company, and is NOT owned by American Movil or it's wholly-owned subsidiary, TracFone Wireless. Neither the F.C.C. or the Justice Department have approved the purchase of Page Plus by American Movil and it's wholly-owned subsidiary, TracFone Wireless. If the government shutdown had not ocurred, we should have seen an answer one way or another by the end of November regarding the proposed transaction. If the shutdown continues, the six month period that Justice gives itself for the review of transactions such as the proposed Page Plus purchase by American Movil could be extended out another few weeks into early December. On the other hand, Justice and the F.C.C. may have already contacted American Movil and Page Plus with a proposal as to what issues/conditions there are outstanding. It will ultimately be up to American Movil if they agree to any proposed conditions/agreement of the purchase of Page Plus, and whether or not American Movil will close on the proposed purchase. Sometimes, an acquiring company will walk away from a deal if the conditions requested by the government are too onerous, or would make the deal not financially viable. Case in point, the proposed acquisition of T-Mobile by AT&T Mobility. If you can get Sprint 4G LTE now on Straight Talk for $45 a month, why would you pay $55 on Boost to start for the same thing. I know that Boost has a shrinkage policy and that after 18 months, the monthly price would be down to $40, but that's 18 months away. Assuming that ST actually does support Sprint 4G LTE now, wonder if speeds through ST would be less than Boost? And I still keep hearing goofy stuff about Boost and starting people over again from scratch when they change phones even where both were Android, etc. What do you guys think? Can you switch a us cellular phone without a kit? If so what is the kit? US Cellular phones don't work on Straight Talk.